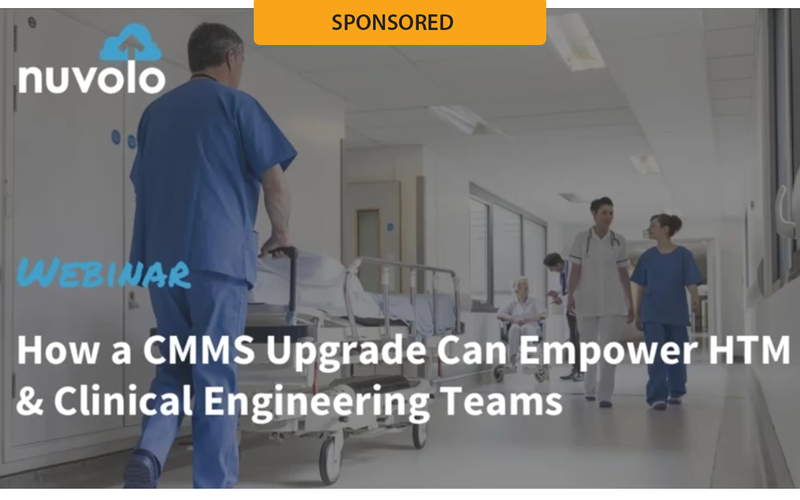 February ended with a bang as more than 200 HTM professionals attended the webinar “How a CMMS Upgrade Can Empower HTM And Clinical Engineering Teams” sponsored by Nuvolo. Participation in the presentation was eligible for 1 CE credit from the ACI. In the 60-minute webinar Ben Person, senior director for solution consulting at Nuvolo, discussed how innovative health care providers are advancing HTM programs by replacing their legacy CMMS. He shared how these thought leaders are upgrading with Nuvolo Clinical EAM – a modern, cloud-based CMMS alternative designed to improve patient care, cut costs and boost compliance. In his opresentations, Person shared how Nuvolo can help a department team make-data driven decisions with real-time reporting and analytics designed for health care providers as well as eliminate expensive and lengthy customization. He also shared how the process can empower technicians with an effortless mobile experience. The webinar received outstanding reviews in a post-webinar survey sent to attendees. “Great information! Good to know there’s someone out there thinking like someone on the front lines,” shared Biomed L. Smith. “This was an extremely useful presentation. I enjoyed that a demonstration was added into the middle of the presentation instead of everything just being slides,” said S. Strzalkowski, Metrology Professional. “Ben did a great job presenting; good speed, transitions and made time to answer questions throughout the presentation, thank you,” said B. Kara, Jump Team Operations Manager. “This webinar was fantastically well put together. The information range that was provided and detail were exceptional given only 60-minute time frame. I wish our system would have waited/or knew about Nuvolo and implemented it instead of the Maintenance Connection software we are now utilizing,” said B. Judah, Biomed Technician. The webinar series also received compliments from attendees. “I love the webinars. Quality speakers and the most relevant materials,” said D. Townson, Clinical Engineering Supervisor. “Webinar Wednesdays provide a consistent opportunity to learn more about hot-button topics in our industry,” said B. Shearer, Executive Assistant. “Webinar Wednesdays are great! I really enjoy them and they are very helpful. I always look forward to the next webinar and always try to attend,” said G. Havens, Site Coordinator. For more information, visit WebinarWednesday.live.